44.1% should be a chilling statistic for all those Tories who proudly think that Margaret Thatcher transformed the British economy for good. Steadily, stealthily, suffocatingly the transformation is being undone by a massive expansion of the state. Today's Daily Mail quotes the Centre for Economics and Business Research's finding that the British public sector will be bigger than Germany's this year because of a £56bn spending splurge by Gordon Brown since 2000. 44.1% of the British national income will soon be allocated by the state. The Berlin establishment has seen the consequences of a nation that became too dependent upon the state and is now seeking to move to another economic model. Britain, in contrast, is becoming more and more like the European economies that have been in the economic doldrums for the last decade. "Germany was long held up as the example of a high spending, high taxing approach that we didn't want to follow here. Now our tax levels are passing Germany and so too are our spending levels and the real tragedy is that no one trusts Gordon Brown to deliver value for money." Margaret Thatcher needed to be the iron lady to bring the British state under control. David Cameron and George Osborne will themselves need steely determination to slow the growth of the state and to bring British tax rates down below those of our competitors. George Osborne's get-tough approach to public spending has attracted surprisingly little attention and supply-siders are still hoping that the 'sharing-the-proceeds-of-growth' formulation will mean that a Tory government will be a tax-cutting government. Editor's comment: "Increasing economic competition will be the reality of the next few years and British jobs are vulnerable to competition from tax cutting nations like Ireland where Bertie Ahern has just won re-election on the back of the Celtic Tiger he helped to create. This is a dangerous time for Conservatives to be advocating a "a shift from an econocentric paradigm to a sociocentric paradigm." Social issues are, of course, vitally important - not just because of the human costs involved but because social breakdown slows the economy through higher welfare costs and its failure to produce the most economically productive citizens. Conservatives must keep ideas for sustained economic growth front and centre, however, if we are to persuade Britain's voters that we can meet their expectations of a rising standard of living." Don't get too hooked up on these figures because spending is calculated differently in each country - Britain hides liabilities and current spending in PFI, Network Rail, and an assortment of offsheet mechanisms. Plus how do we account for Tax Credits ? As "Benefits" and Public Spending or as Negative Taxation and thereby a reduction in income tax. Germany has its education spending at regional not federal level and deficits hidden in KfW and by slowing payments to EADS for Eurofighters and A400M....it has extremely poor military barracks in the West and crumbling public infrastructure in Western cities because of huge transfers to the East. Britain has much higher levels of public spending than ONS statistics indicate but the exact same problem of unfunded public sector pension liabilities as Germany, and Germany raised VAT from 16% to 19% on 1 Jan 2007 to raise more revenue and accelerated VAT receipts into 2006 thereby. I thought Cameron didn't want to cut spending. If Osborne thinks the percentage too high, why can't he promise to cut taxes over the lifetime of Parliament? Or is it just words for PR effect? question: Would you invest in Britain when you have the choice to base operations elsewhere? answer: No. Tax. Regulation. Lack of a health service. lack of an education system. lack of a police service. lack of anything. Anyone who has the money and the opportunity is getting out. the place is filling up with those who have no choice but to come to the UK like Poles, Bulgarians, Romanians etc. We are competitive only with countries that have endured the Soviet empire for 75 years. The rest of the 'free' English speaking world grows at double our rate - Australia, canada, USA. Asia grows at double that. The UK is a failing state, with a broken society. The Blair years have destroyed Britain. Brown will merely bury the body. Errr. British business's most profitable ever year was 2006. Grow up the lot of you. A positive agenda for increasing economic growth can help win elections, however. Editor, growth is simply an increase in GDP....it is how it is generated that matters. The well spun myth of Britain's "strong economy" and Brown's "prudent" Chancellorship is coming under increasing scrutiny and found wanting. The fact is we are underproductive and overborrowed and stagflation/recession/depression lie ahead. We live in a country fantasising about its ability to run up debts seemingly without end, to enjoy high-paid employment for which it is not qualified, to project military power that it does not possess and in general to assume, in defiance of the evidence, a superior economic and political position in relation to most of the rest of the world. Then there is the apparent conviction that limitless growth can co-exist with environmental protection, that the over-borrowed and abundantly staffed state machine is actually being courageously pruned even while its payroll rises and, finally, that the just-around-the-corner radiant future is one in which will work in the 'creative economy'. Welcome to Fantasy Island. He may be the most spectacular election winner in modern British political history but Blair leaves behind him a seedy dreamworld mired in debt and bankruptcy, drifting into a crisis of employment and employability, hallucinating into existence a diplomatic and military role that it cannot possibly afford. It's time to take stock of the future he and Brown have mapped out for us while there's still time to do something about it. Dome And Gloom, with small companies regulated out of the game by the EU, big companies are free to extract the prices they need to boost profits. Small shops close. Communities die. Big companies look good as they push their sourcing out of the UK. It's the Tesco effect. Poles stack the shelves. Brits on social security buy the goods. Hallelujah! No doubt Brown has got a lockerful of Cameron and Osborne quotes on'sharing the 'proceeds of growth''economic vibrancy of immigration' etc etc. The Tory leadership has got itself well and truly hooked on managerialism with a PR gloss and neglected the unwelcome divisive and necessary intellectual rethinking on every core issue. As soon as someone proposes anything remotely relevant and new the leaders try to close down debate with the dreary efforts to avoid sounding'nasty'. What was the percentage in 1979, and what was it when Maggie left office? Have we actually ever reduced the size of the state? "Editor, growth is simply an increase in GDP....it is how it is generated that matters. Germany, China, Japan grow GDP by Exporting.......Britain grows GDP by increasing the sale price of housing and paying estate agents bonuses...."
He is also absolutely correct about PFIs and the long-term damage these will cause to the economy. We are substantially mortgaged for years to come. 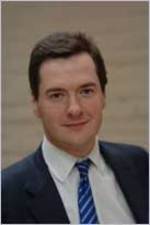 The first thing perhaps for Osborne to do is to recalibrate what is really going on in the economy at the moment: (i) identify the rate of inflation that actually affects people (not the CPI), (ii) bring the PFIs onto the balance sheet, (iii) aggregate income tax and NI contributions, (iv) keep repeating the increase in the overall tax take over 10 years and (v) keep on quoting the amount of personal indebtedness. Given the amount of taxpayers' money that Brown in particular and the government in general has squandered over that period, it would be salutary to estimate this and keep on quoting it. Just to manage things properly would help reduce this dire figure of 44.1%. Public spending as a proportion of GDP was 44% in 1979 and 39% in 1990 and 1997. Its peak was at around 50% in 1975. Disturbingly, public spending as a proportion of GDP has been rising since 2000, while falling in most major economies. At the next election OldLab will be able to scare the public sector with the threat of spending cuts if a Tory government is elected and massive job cuts with a reprise of Maggies knife to the public sector. Should the Tories be elected then they will be in a cleft stick, they can cut taxes but will have to slash the public sector and face the backlash from the left and unions, failing to cut taxes will inevitably mean an increase in taxes if only to stand still to inflationary demands. Gordo and NuLab have left us the inheritance of PFI, a particularly nasty minefield for future generations to tread around. NuLab have well and truly stitched the game up for others. The public sector are not going to vote for job losses or paycuts, so OldLab are assured of large support, and as they increase the public sector will seek to gain sufficient voter backing to make elections a foregone conclusion and eliminate the need...having created the perfect, workers, revolutionary, socialist paradise. As we become economically moribund then a government can happily sign us away to perdition and the EU, as we become the experimental first regions to be ruled by Brussels. What a thought and possible scenario, if we do not do something, sooner rather than later, to get to grips with state spending and take Gordo's and his successor's cheque book away. Any idea's?, short of doing a modern day Guido of course. For a historical perspective on Sean's last comment, courtesy of 'The Bumber Book of Government Waste' - statistics the authors collected from the House oF Commons Library - government spending as a percentage of GDP was just 10% prior to the outbreak of the First World War. Since then it increased with stops and starts, peaking in 1985 at 39% of GDP just before Thatcherite reforms could start to take effect. Interestingly, the full force of Thatcher's reforms was only enough to take the figure down to 35% ten years later in 1995 - with the figure again growing as we head towards the end of the century. The figures go no further than 2000, so Brown's spending boom is not covered. In relation to these figures, 44.1% would seem accurate. "Errr. British business's most profitable ever year was 2006. Grow up the lot of you." "I thought Cameron didn't want to cut spending. Have I missed something?" The solution is radical reform. Change the basis of the calculations so that direct comparison is not possible and present cuts in the totals as efficiency savings. Until the Conservative Party commits itself to slashing government spending it will not be a party many Conservatives will want to support. No, it isn't just spin. Margaret Thatcher never actually cut spending year on year but she reduced the rate of growth so that public sector spending was a smaller proportion of GDP. There was a lot of talk of "cuts" in the Thatcher era but, in the main, these were just a reduced rate of increase. If you listen to what Cameron and Osborne are saying rather than accept the "no tax cuts" spin some people put on it, you find that they are proposing the same. To put some example figures on this, let us assume that GDP is now 100 and public sector spending is 44. If the economy grows by 5%, GDP will be 105. If public sector spending grows by 3%, it will now be at 45.3 and public sector spending will be down to 43.2% of GDP. Over 5 years, public sector spending would drop below 40% of GDP. I'm not claiming these figures are real, but they illustrate the point that you can cut taxes whilst increasing spending as long as the economy is growing. One of the problems with selling this message is that numeracy is poor in the population at large. Most people assume that tax cuts can only be achieved by cutting spending. Not true, but it makes it hard to sell a message that says we will cut taxes but won't cut the public services that matter to voters. To the average voter, tax cuts equal cuts in services. Traditional Tory may want to slash government spending, but that message would guarantee loss of the next election. In any case, I don't think Cameron and Osborne have said they won't cut spending. I think they've said that they won't cut spending in certain areas (health and education, for example). Sensible politics as it blunts Labour's attack that we will destroy the NHS and undermine children's education. However, there are other areas where cuts have not been ruled out. The key economic reason for lower taxes is not so much tax competition for even in a globalised age only a small amount of investment in jobs is internationally mobile. More important are the effects on work incentives, money left over for business investment, and the proportion of the economy's resources devoted to the wealth-creating as opposed to wealth-consuming sector. Plus how do we account for Tax Credits ? As "Benefits" and Public Spending or as Negative Taxation and thereby a reduction in income tax. As I understand it net payments count as benefit and where the result is merely reduced taxation it works out as a tax reduction, even the statistics for the total overall effect on the public accounts on this are extremely complicated. government spending as a percentage of GDP was just 10% prior to the outbreak of the First World War. Since then it increased with stops and starts, peaking in 1985 at 39% of GDP just before Thatcherite reforms could start to take effect. If I remember correctly from the statistics I saw in the first decade of the 20th century public spending was at 14% of GDP and taxation at 10% of GDP at it's lowest. There was then a surge during the First World War with public spending only falling back to a bit over 20% of GDP shortly after and then generally rising through the 1920's and 1930's closer to 30% of GDP. Then there was a surge during WWII and then it came back down to below 40% of GDP after WWII, it then fell in the early 1950's down towards a third of GDP before rising in the late 1950's and into the 1960's (except for a brief spell in the late 1960's when Jim Callaghan cutback much of public spending and it fell as a proportion in one year) and 1970's (actually accelerating under Edward Heath) when it peaked in 1977 at close to 50% of GDP. Then it started coming down in the last 2 years of the Labour government and continued to fall initially before rising again mainly due to high unemployment - up to 44% of GDP and then it fell back into the late 1980's below 40% of GDP for the first time since the 1960's. Then of course it was hugely increased under John Major who initially raised spending and cut tax leading to a massive increase in the budget deficit even before the debacle of the ERM came to a head, peaking at 45% with tax soon after hitting a similar peak in 1994. Then tax and spending fell year on year as a proportion of GDP falling to it's lowest proportionately since the mid 1950's at around 35% of GDP at the end of when Labour was still basing it's spending on the spending plans left by the previous Conservative government and since then spending and taxation as a percentage of GDP has gone up year on year to it's highest since the late 1970's. As the Conservative Party has ruled out cuts in the overall Education and Health budgets and is moving to commit themselves to raising defence, anti-terrorist and police spending and building more prisons this rules out a lot of public spending for economies. If it were up to me I would initiate a freeze on Education and Health spending, immediately stopping all new recruitment of staff and all new building, and where it would save money would cancel PFI projects in those. I would also want to see unused property of those sold off and the transferal of schools and hospitals either fully to the private sector or to charities limited by guarantee and extension of charging to cover costs. Museums and art galleries could be transferred to private charities limited by guarantee and be expected to raise money by charging entry fees to cover costs and other commercial activities. The Arts Councils could be woundup along with all grants. All publicly owned leisure centres, civil airports, the Covent Garden Market Authority, Royal Mail, Parcelforce, Royal Mail's overseas assets, Crown Estate, Duchy of Cornwall, Duchy of Lancaster, BBC Television & BBC Local Radio could all be privatised. A number of other organisations could be sold or wound up or required to be self financing. DCMS and dti could be abolished along with most labour market regulation. Bring back debtors prisons, charge prisoners for their accommodation in prison and any other costs including food and require that those declared bankrupt including for costs of detention be incarcerated and required to work off their debts with interest chargeable on outstanding debts - Texas has some such institutions. Equally, why not replace benefits for asylum seekers with low interest means tested loans and permit asylum seekers to work. Indeed allowing joint claims as asylum and economic migrants would hugely reduce the amount of begging and street crime as well. With a general downsizing of the civil service this would leave more money to be spent on railways, environmental projects, space exploration, defence, national security, policing, prisons and general scientific research. In addition this would leave money free for repaying national debt and cutting tax. YAA, the still small voice of reason as usual, I just have a problem with making prisoners pay for cost of prison place. Not a moral problem but a financial one - a prison place costs around £30,000 a year, so it would never be paid off, not ever. Not a moral problem but a financial one - a prison place costs around £30,000 a year, so it would never be paid off, not ever. Cut back on the spending on prisoners, spend less on food, provide smaller cells and save on the heating. Prisoners in Texas with no money who go into debtors prisons still get out in the end having paid off their debts. YAA, but how does it work in practice? You'd have to sew a lot of mailbags to make a net income of £30,000, let alone paying off other debts. On the other hand, I suppose that's what makes it a good rule - prisoners would never get out. There was a famous quote of John Biffen in cabinet saying "We're all Social Democrats now" shortly after he had persuaded Margaret Thatcher that to balance the books the government had to increase VAT to 15%. Felons could be used compulsorily for medical experiments that otherwise would be carried out on animals, US prisons used to use prisoners in such a way. Experiments on humans are more accurate than ones on animals and because they were prisoners it could be considered part of their punishment and offsetting any debts, the workhouses in the past were contracted out mostly to private organisations - so private medical companies could be allowed to conduct experiments on prisoners in exchange for money. In the US a lot of airline seat reservation is handled by prisoners. In fact to borrow an idea from the film the Most Dangerous Game and also using ideas from Ancient Rome - Prisoners could be forced to take part in gladatorial contests or to be hunted by people paying to do so. I am sure that prisons could raise money by charging to view executions and selling tickets for people to view prisoners. Compulsory blood and organ donation perhaps? - in the past money has been raised from criminals without sewing mailbags. Yes, it is projection, just like when a certain gentleman used the word delusional about members of his own party. British state, German state, this is old paradigm thinking. Think of the future - think 'Europe'! I am reminded for the apocryphal (albeit fictional) meeting between Saddam Hussein and Bush Snr, when the former (a Star Trek fan) noted that the Starship Enterprise had a multinational crew but no Arabs. Bush's explanation was simple and to the point: "It's set in the future," he said. For much the same reason, there is no particular point in thinking about "Europe". It's either describable as apocryphal or fictional as if it's origin and authenticity is apocryphal then presumably it isn't known if it is true or not and therefore is either factual or fictional. Most likely it is rather a myth. Although just like Treasury accounts it presumably isn't clear which it is. Yet another anon: I think my story comes under the category of "isn't true but should be and in the course of time will become so...". Bit like the opposite of a party political manifesto, really. Quote: "Editor, growth is simply an increase in GDP....it is how it is generated that matters. I would add that we also grow our GDP by accepting unlimited immigration. I have never attacked anyone personally in any of my postings, but I am getting a bit worried by Yet Another Anon's recipes for curing the country's financial problems what with privatising the BBC and compulsory vivisection for prisoners etc. All this bleeding heart, pinko liberalism will bring the site into disrepute. As many on this site will know, I have an intense dislike for Brown, and its not so much for his political belief's, thats okay, we are all entitled to them, I'm a Tory, there we are. But it's the way in which he operates that disturbs me. He seems to be physiologically lead, usually this is due to a parent's influence, in this case I'm sure it's his father. This has distorted his view on what success in politics is defined by, and the end result is that he is driven by his fathers hatred for the Conservatives rather than the more pure desire to improve the country. This has one big unfortunate effect, he is driven, so there are no limits as far as he is concerned. PFI & screw the Tories in power 20 years from now? Absolutely. Run up a mountain of debt before they might win power? legitimate and could get me back in. Get the poor hooked on tax credits? More blockers for the Tories, good. Unreformed public services? Yes, this is the constant war that keeps me in power. Use lies and emotional blackmail on the public? Absolutely, I have convinced mysely the Tories are lieing, so I can 'lie' about what they will do. Devolve power in Labour core vote regions so we retain power when the Tories are in? Yes yes, not gone to plan exactly, but still they are screwed, so good. I assume you mean psychologically. Physiology relates to matters anatomical. Unfortunately Oberon, Graham Brady considers himself a Tory too, but you publicly branded him a creep. But re tax, some cold, hard, empirical truth from the Adam Smith Institute. Ready? Tax Freedom Day has actually been before 30 May more times under Labour than under the Tories. So, let's not pretend the Tories would take reduce the overall tax take, as on average, you have no record of doing so. The only genuine tax reduction pledge is a pledge to reduce the Tax Freedom Day. Tsar Cameron and his tsarinas will not be doing that. Normally Labour governments have come into power pledged to increase spending significantly and have done so and then retrenched after a few years whereas Conservative governments have come into power pledged to cut spending and after usually initial cuts have then at some point totally undone what they previously have done although the 1979-97 government did eventually get back on track with public spending. Chelloveck: I would like to say that I regret calling Brady that, it was done in the heat of the moment, and with Blogging one does sometimes say things that one would take back once they cool down. I note that Brady has has been involved with education policy in various roles before and now think his motives were strongly motivated on principle. Although, I also think he should have resigned first, then stating his reasons, not decided to feed data to The Times and write articles for the New Statesman that undermine his own leadership whilst on the payroll. Finally, I pay for mistakes made on this site, as everyone knows the name of who made them, you on the other hand are far more coy. I understand that Oberon, but you have lost a good man today, and you were part of the rabid pack that was biting into him yesterday which was likely to have played some part in his decision to resign. You did the Tsar's bidding. And now a principled man had left the fold and most likely will not return until the party is under new leadership. The depressing thing is not the size of the state but rather its oppressive and dysfunctional nature. We shouldn't be ideologically committed to a small state as such - we do get free education and health and we do want strong defense and law and order after all - but rather we should be making the case for sharing the proceeds of growth between higher spending and rewarding people with a lower tax burden. It might be a shame, but if we drastically reduce the size of the state it will be front line services that people want that will bear the brunt one way or another rather that the faceless bureaucrats that should be got rid of. although the 1979-97 government did eventually get back on track with public spending. It did however do something insane in Overfunding Government Debt to soak up liquidity and created huge blocks of Gilts with high yields which suggests it did not really control the monetary base which would have required institutional changes in The City.